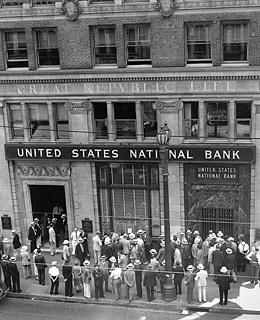 A crowd gathers in front of the main banking office of the United States National Bank in Los Angeles, Ca., Aug. 24, 1931. The 1933 Glass-Steagall Act established the Federal Deposit Insurance Corporation (FDIC) to insure bank deposits and regulate some operating practices. In October 2008, Congress authorized the Treasury Department to spend $700 billion to shore up struggling banks.